Montreal, Canada June 12, 2018 – Effigis Geo-Solutions Inc. (Effigis), a provider of CaTV Egress and Ingress solutions, and VeEX Inc. (VeEX), a global leader in Telecom, CATV, Fiber, Transport and Broadband Access, today announced a partnership agreement that integrates Effigis’ Digital Leakage and Ingress technologies into VeEX’s VeSion test and measurement platform. Effigis’ CPAT FLEX solution allows operators to detect and continuously monitor egress and ingress before these anomalies adversely impact customer service. Enhanced reporting tools including alarm notifications immediately alert key personnel as problems develop. CPAT FLEX can operate as a stand-alone solution or as a value-added component to existing proactive network maintenance (PNM) tools. 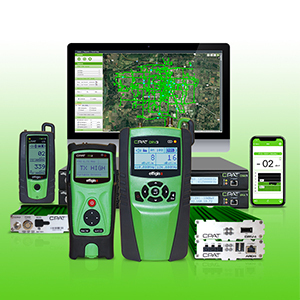 VeEX‘s VeSion cloud-based server platform integrates VeEX’s RF Monitoring probes, Sweep system and Fiber Test Units to verify, maintain and troubleshoot the HFC network. Additional service delivery tools including PNM, DOCSIS Monitoring/Demodulation and MPEG analysis identify impairments long before they become noticeable to the subscriber. Centralized workflow and Asset Management ensures maintenance is kept simple and secure, reducing the dependency on separate bespoke systems offered by service provider teams. VeSion’s ability to support all these applications under a single umbrella is truly unique. “Effigis considers VeEX a strategic partner to enhance its global position with cable operators. Integrating the CPAT Connections application to the VeSion platform provides deeper intelligent analysis of overall touch points within the cable operator’s network,” said Magella Bouchard, VP Telecom CPAT Division at Effigis. “The partnership enables cable operators to align different specialized test tools to improve the proactive maintenance of their network,” said Cyrille Morelle, CEO/President of VeEX. “Reducing costly truck rolls and enhancing subscriber quality of experience is the primary goal of service providers worldwide, thus working together to make our respective solutions compatible is a significant step especially as both companies expand globally and address many of the same customers,” he added. Effigis develops and commercializes CPAT FLEX, a modular GPS-based leakage/ingress monitoring solution that helps broadband operators improve the efficiency of their fleet operation and system plant maintenance. VeEX® develops innovative test and measurement solutions for next-generation networks. VeEX products blend advanced technology and vast technical expertise with the discerning measurement needs of customers.